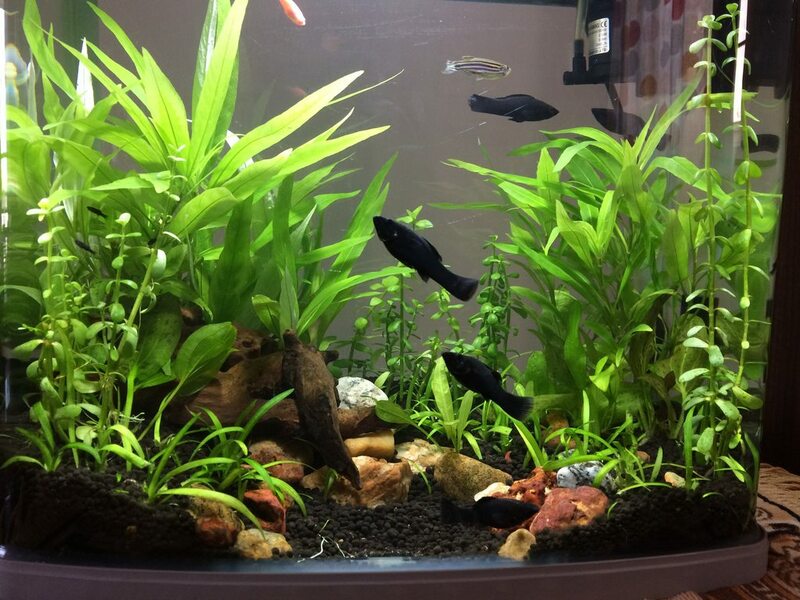 My first planted tank, its a 9G Nano tank (~35 L). Tanks: 15'' (L) x 9'' (W) x 16'' (H), acrylic tank with built in top filter. I got the used tank and replaced the power head and the lights. Lighting: 9W LED - 6500K. Filteration: Top filter with filter media and activated carbon. 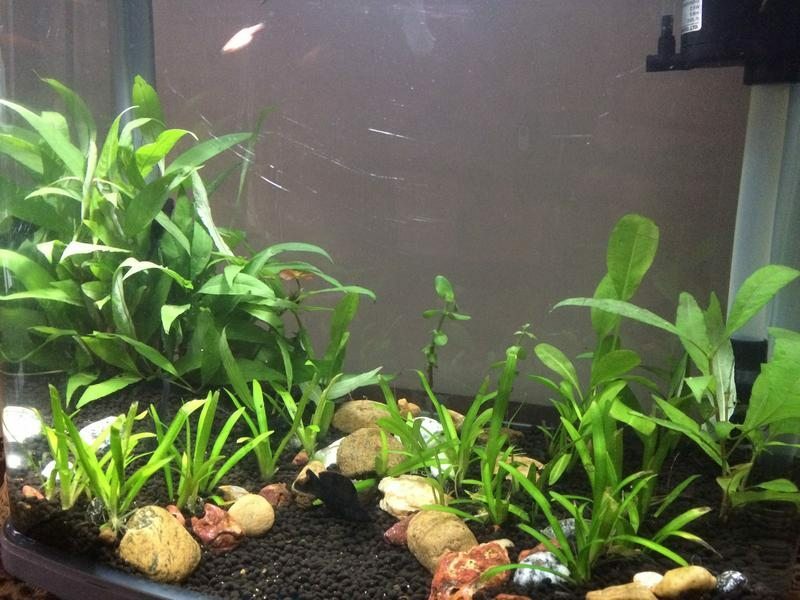 Substrate: Fluval Plant and Shrimp substrate. 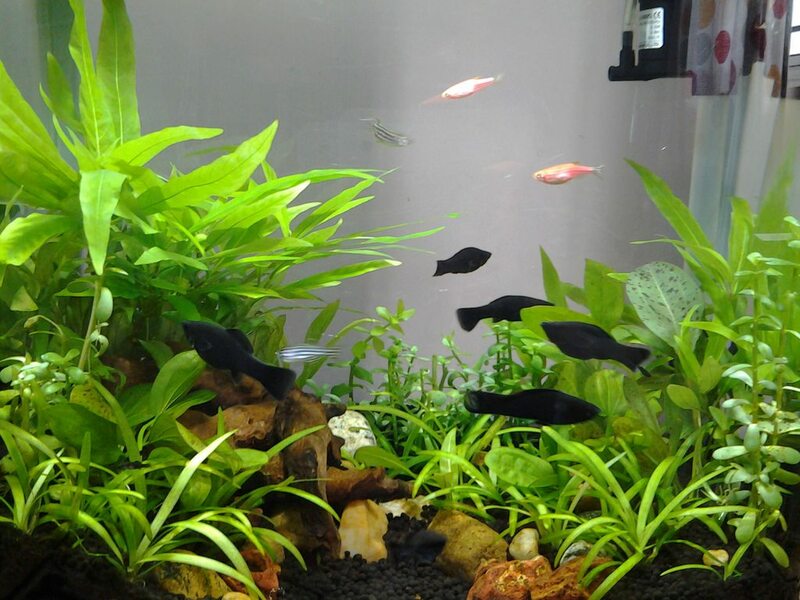 Fish: Black mollies and zebra danios. I love the dense planted areas. Is there a piece of wood in there as well? How long has it been since the setup? What is the photoperiod? Thanks @Da_vipin, will send a pic of the top filter for your suggestions. The powerhead does have an outlet inside the tank which creates some circulation. But I agree it may not be optimal. Thanks @ashwin1224. There is a piece of wood, but it is just there, there is no scaping around it. I am using the wood to keep the H. Corymbosa stems upright, it seems to do a decent job. Its about a month old, the photo period is between 8-9 hours. 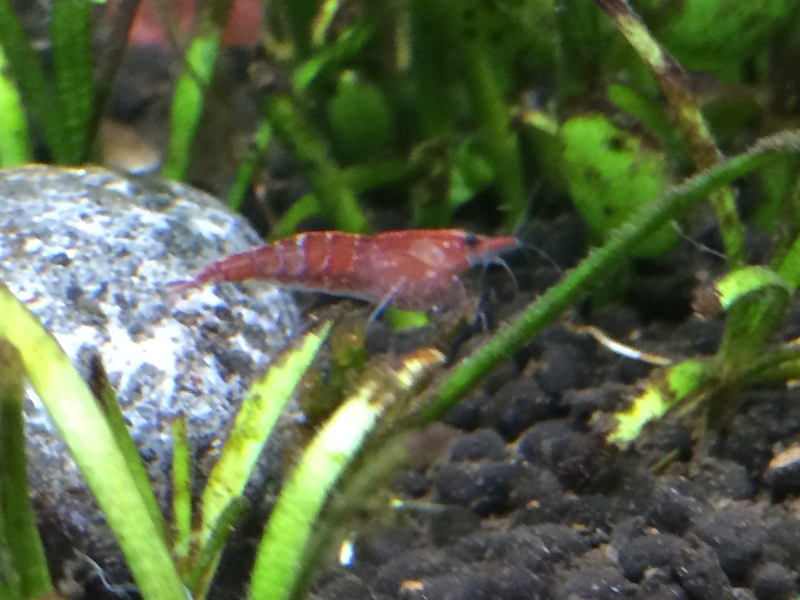 Found that 2 Kg bag of Fluval Plant and Shrimp substrate was not enough to give me coverage. I later bought another bag and topped more substrate. I keep topping some substrate every once in 2-3 water changes. The B. caroliniana had almost melted away, the mollies made small work of what was left. Now a last couple of stems are holding on. We were away for 3 days and there was no photoperiod or feeding during this time. We come back to find that the fishes and plants are both doing fine and what ever green spotted/ brown algae was on the leaves are completely gone. So what can this be attributed to? The lack of photo period or the mollies not getting their timely feeds? Nicely done, welcome to planted tank journey. Lots of plants died out due to lack of care. I managed to salvage the remaining plants and keep on to the existing layout. All the Echinodorus varieties are completely out. The dwarf sagitarria was also not doing well. I have added root tabs and it seems to be picking up with new broader shoots. 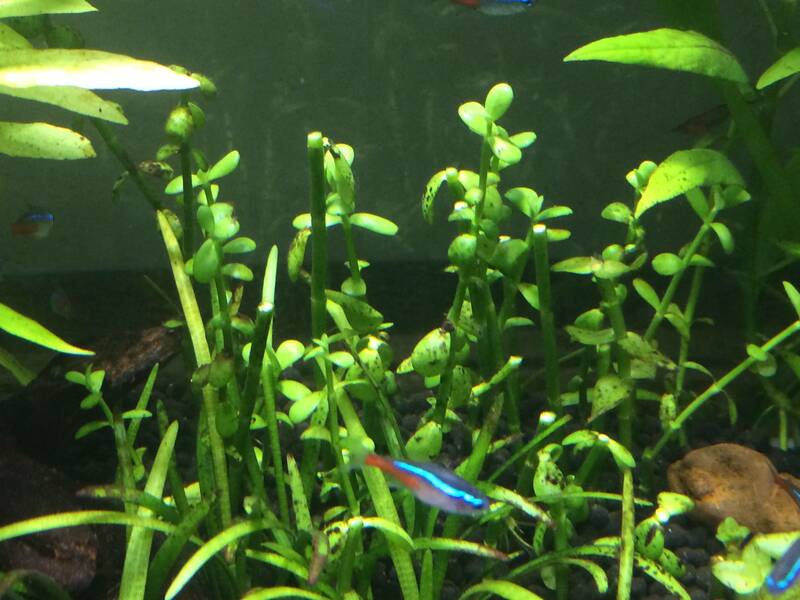 Bacopa caroliniana is almost done, few stems are surviving, B. monnieri is doing well, but not thriving. Possibly time to change the light bulb or replace with a new fitting. But there is no stopping the Hygrophila. It is still growing very quickly. 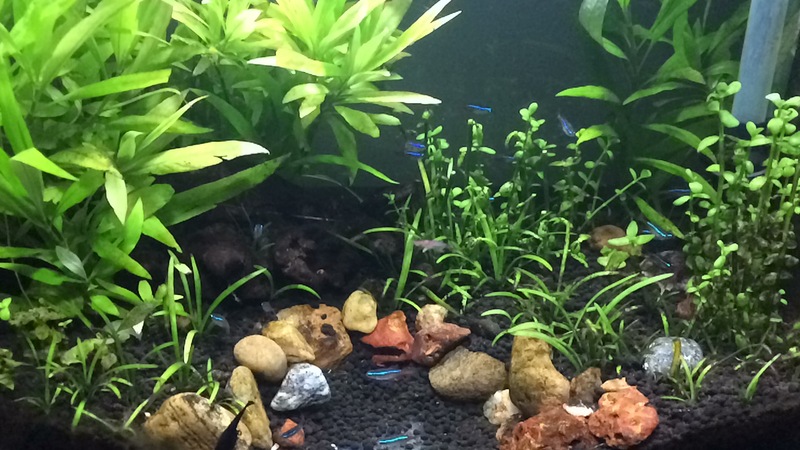 Now the tank holds Shrimps and Neon tetras and a lone black Molly baby. Few recent pics. If possible, please remove the activated carbon from the filter. It will absorb all the nutrients you are giving to your plants. 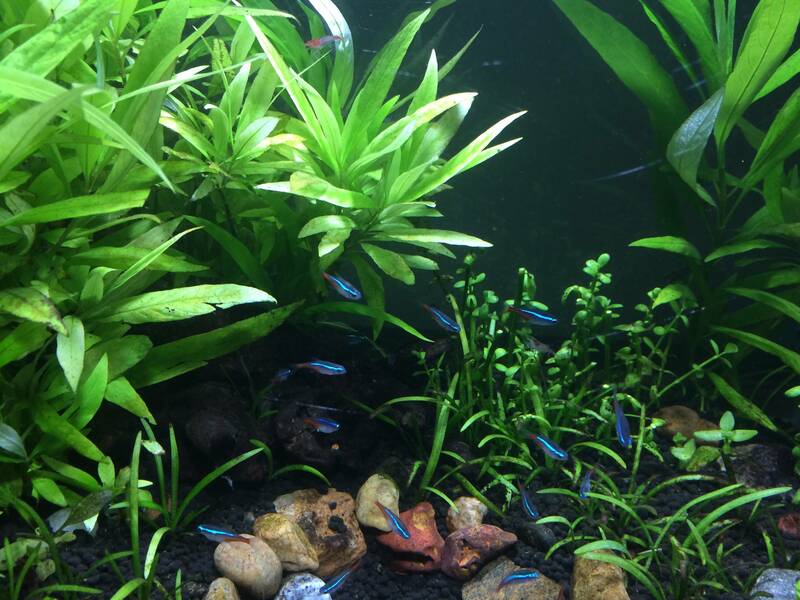 Also, top filter is not good for planted tanks, as it breaks the water surface, thus reducing the Co2, required for the plants. Try a DIY Co2 (yeast+sugar) for optimum growth of your plants. Everything else looks good . Good work. @koushikman, had removed the activated carbon long back. outlet of top filter is almost at the level of the water, there is hardly any break in water surface. Deliberately not going for a CO2 setup to keep it low tech. @garothmaan, when posting did not check the image width, will be cautious on this aspect. Sorry and thanks.